Posted January 21, 2014 by Will (Chief Information Officer) . Ask anyone in marketing and they will tell you content marketing is crucial to the success of your business now more than ever. Content creation gives your business a chance to come across as an original, fresh and stimulating source for your audience, while presenting industry-relevant information consumers will find useful. While we know how important original content is to marketing, time and time again the excuse of being in an industry that is ‘boring’ is used to mask a marketer’s inability to create meaningful content for their company. The truth is, every single industry presents the opportunity to position yourself as an expert in your field and provide meaningful content to your audience. The following three tips will provide insight into creating content for difficult industries and allow you to have some fun while doing it! It’s crucial to remember when creating content that your followers are following you for a reason. No matter what industry you are in, you can always find a way to relate it back to your consumers. For example, if you’re in the finance industry, you could create content on money-saving tips for college funds or the best places for retirement. Just like that, you’ve taken finance and made it relatable to your audience. Providing useful tips, infographics or blog posts gives you the creative outlet to give pertinent information to consumers with your own spin. Creating original content is also a great branding opportunity for your business. Branded content allows you to have control over the messages and images you are sending while connecting with customers in a non-traditional way. However, branding with content is not a time for shameless plugs nor relentless pushing of your services- you will alienate followers and likely lose their attention for good. What is okay is creating a voice for your company that your followers can grow to know and love. 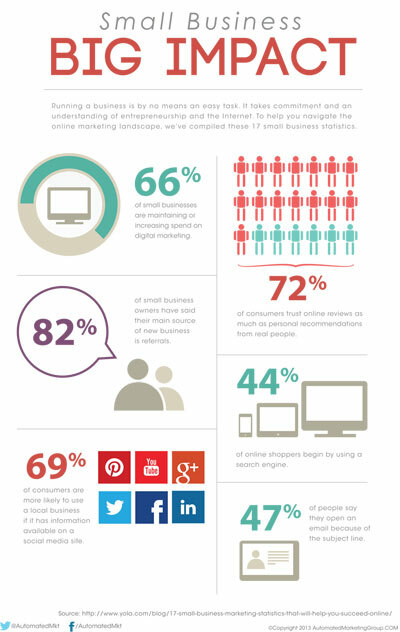 Create original and branded content by incorporating company blogs, positioning yourself as an expert with open question forums, taking the time to have your graphic designer create a branded infographic that represents real data like our example below and, most importantly, listening to what consumers are saying. Creating an Infographic (like ours above) allows others to share your original content and show data of your own. Think of an infographic as a creative outlet for displaying what would be otherwise a dull collection of numbers- and a chance to brand it as your own! When creating content for your business, it is important to create a concise plan of where you want to take your marketing. Creating an editorial calendar can be a helpful tool when planning social media efforts for an extended period. This also allows you to analyze your efforts to see which content worked, which failed and where you can improve. Find out which social networks work best with your consumers as well as which time of day and content they interact with most. As you can see, there are many different ways to create original content for your brand, no matter the industry. There are few limits in the direction you can go, as long as you have the creative mindset to go there. With an intentional plan, original content and a relatable message, you can effectively reach your audience every time. Still not sure you have what it takes to tackle marketing for your company? Contact us today! Our social media and content marketing experts are here to help!